The Sheraton Fort Worth provided my family with a weekend stay at their hotel. All opinions, experiences, and photos are mine alone. In case you hadn’t heard, Texas is a big state. So big in that on most road trips we spend a majority of our time just getting out of the state. And we live in central Texas. Just imagine how long it would take if we lived in a border town. We’ve lived in Texas for almost six years now aside from exploring locally in the Austin-San Antonio area, we haven’t really ventured out into other areas. There are so many interesting and unique attractions in the state, that it’d be impossible to visit them all but we’re hoping that eventually we’ll be able to experience a great number of them through staycations. Although when you’re driving 3+ hours, is it still a staycation? 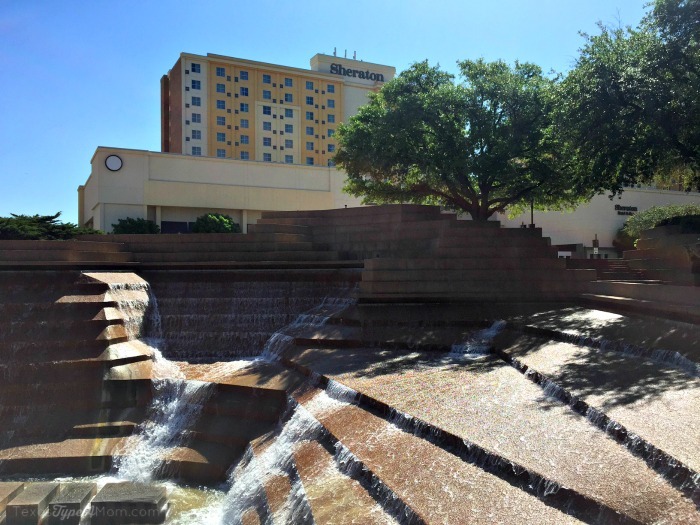 Last month the Sheraton Fort Worth invited my family and I to stay at their hotel and experience the city. In all honesty, before this trip it had never occurred to me to visit Fort Worth. In my mind, it was an extension of Dallas and just another possible traffic jam on the highway while trying to make our way to visit family out of state. The hotel is currently undergoing major renovations (although these didn’t interfere with our stay). By the work that has been done, you can tell that they’re definitely working towards a more modern feel. We had great service during our stay with a prompt check in and friendly interactions with the front desk staff. Off the lobby, you can find the hotel spa and pool going in one direction and in the other you can find a bar, meeting rooms, gift shop, restaurant, and the elevators. 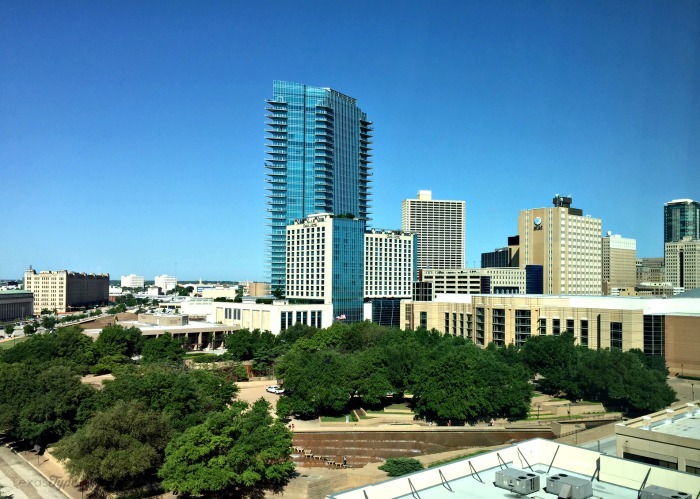 Our room was located on the 8th floor and featured an impressive view of not only the downtown Fort Worth skyline, but also the Water Gardens across the street. The room featured two queen sized beds, a coffeemaker, TV, and desk with power strip (iPad charging made easy for those restaurant waits or car rides). I would have liked to see a mini fridge in the room to store snacks or leftovers, but for a weekend stay this certainly wasn’t a deal breaker. Free wifi was also included in the price of the room, but I also noticed that there was an upgraded package available for those using more data. Had I tried to do more work while visiting, this may have been an issue but the free wifi did the trick for our web surfing and the girls streaming Netflix. 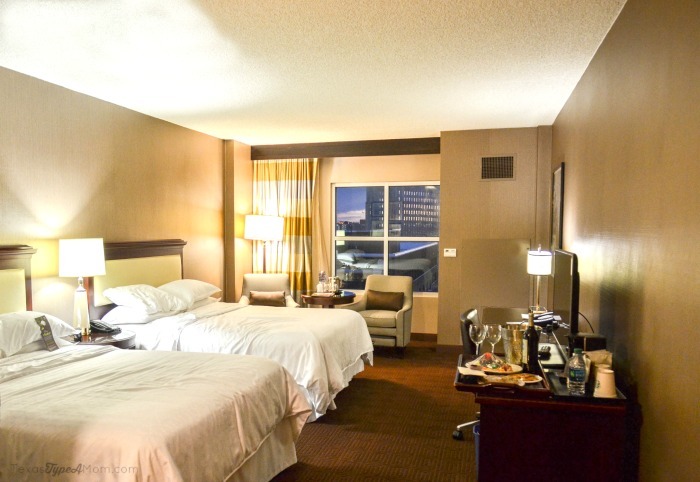 The Sheraton Fort Worth is conveniently located off I-30 where it intersects with I-35W. No worries about getting lost on the way to your hotel or driving through sketchy neighborhoods. The location is also convenient for visiting some of Forth Worth’s most well known attractions such as the Botanical Gardens, Fort Worth Zoo, and the Stockyards. 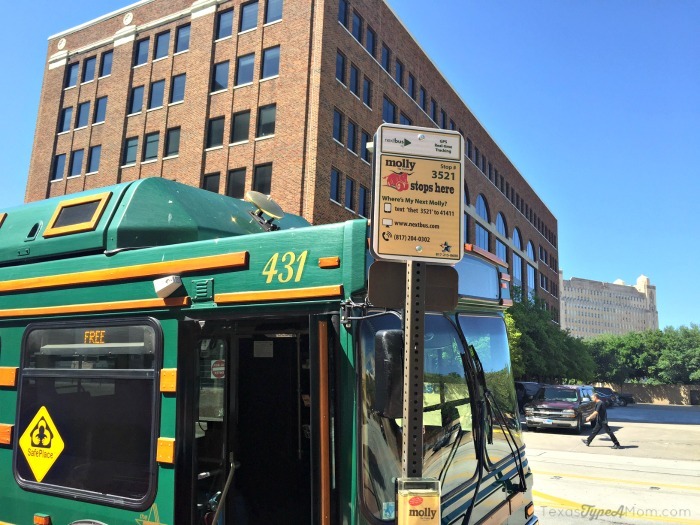 When you have the convenience of staying downtown, there’s likely to be a parking fee. It’s $20 at the Sheraton Fort Worth but there is a garage so you can get covered parking and feel secure leaving your car overnight. If you don’t feel like driving once you check in, there are lots of restaurants within an easy walk of the Sheraton Fort Worth. Or if riding is more your thing, there’s a Molly the Trolley stop right outside the front doors with free service around downtown. After visiting, I can now admit how wrong my initial assumptions were about the city. Fort Worth is a pretty great city and surprisingly reminded me a lot of Austin. It was a nice blend of weird with a healthy dose of western cowboy mixed in. The parts of Fort Worth we visited were very clean, well laid out, had unique architecture, and some amazing restaurants and attractions. 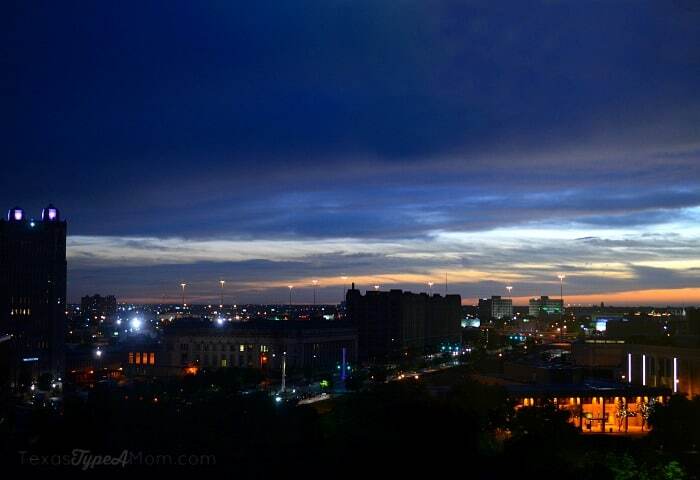 Have you visited Fort Worth? What was on your must see list? What’s your favorite local staycation/mini vacation destination in your state?